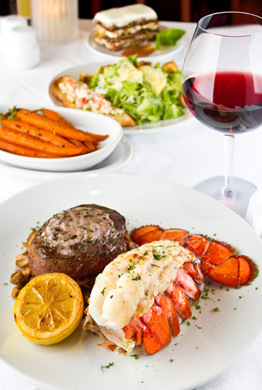 Fleming’s Memorable Meal—a complete three-course dinner featuring Filet Mignon and Lobster Tail—is available until Wednesday, Dec. 15 at Fleming’s Prime Steakhouse & Wine Bar two Chicago locations: 25 E. Ohio St., downtown Chicago (312) 329-9463; and 960 Milwaukee Ave., Lincolnshire, Ill. (847) 793-0333. Fleming’s executive chef, Russell Skall was inspired by a culinary memory of the “scent of aging wine, seared steaks and grilled lobster infusing the air,” for the decadent Memorable Meal menu. The appetizer is a Caesar Salad with King Crab Crostini, classic Caesar topped with Alaskan king crab on rosemary sourdough toast. The entrée includes the Cellar Master’s Steak and Maine Lobster Tail, filet mignon on sautéed mushrooms, topped with a red wine, olive and herb butter paired with a broiled lobster tail and drawn butter. A side dish of Maple-Roasted Baby Carrots is also served. Dessert includes Carrot Cake with Dark Pineapple Rum Caramel, a three-layer carrot cake with cream cheese frosting topped with a drizzle of dark pineapple rum caramel. The Memorable Meal is $99 for two people, or $49.50 for one guest. The 3-course dinner is not listed on Fleming’s regular menu, and is available by reservation. Just mention “Memorable Meal” when making a reservation. Fleming’s Prime Steakhouse also offers an innovative Three-course Prix Fixe Dinner inspired by the vibrant flavors of the season. The prix-fixe dinner is $39.95 per person, available now through Jan. 3, 2011 at both Chicago area locations. Guests choose one of two appetizers, one of two entrées, plus a dessert. Appetizers include the option of Oysters Rockefeller, three freshly shucked oysters baked with sambuca-laced creamed spinach, shaved parmesan cheese and crispy bacon bits; or an Autumn Salad, crisp spinach and baby lettuce, toasted almonds and grape tomatoes tossed with red onion balsamic vinaigrette, served with blue cheese and bacon crostini. 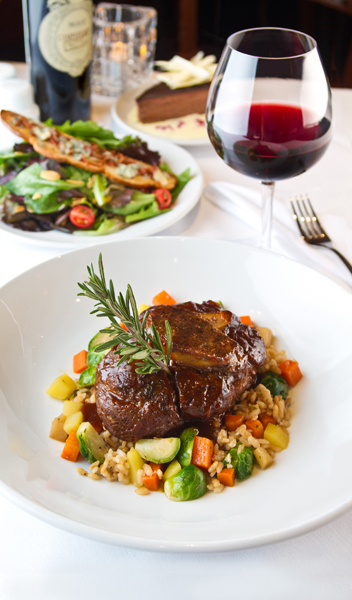 Entrée selections include Veal Osso Bucco, veal shank served on creamy risotto with roasted seasonal vegetables; or Cioppino, shrimp, seabass, clams and black mussels in a spicy tomato broth, served with a sourdough crouton. Dessert is a Dark Chocolate Cheesecake, served on crème anglaise with raspberry coulis.